Hyman ('Harry') Hetchin started selling bicycles in the 1920s; later he acquired a partner and frame builder, Jack Denny. Victory in the World's and Olympic Championships in 1936 entitled Hetchin to display the champion's color bars on his transfers. The elegance and fine workmanship of the frames have made the marque legendary. This web site is offered in appreciation. 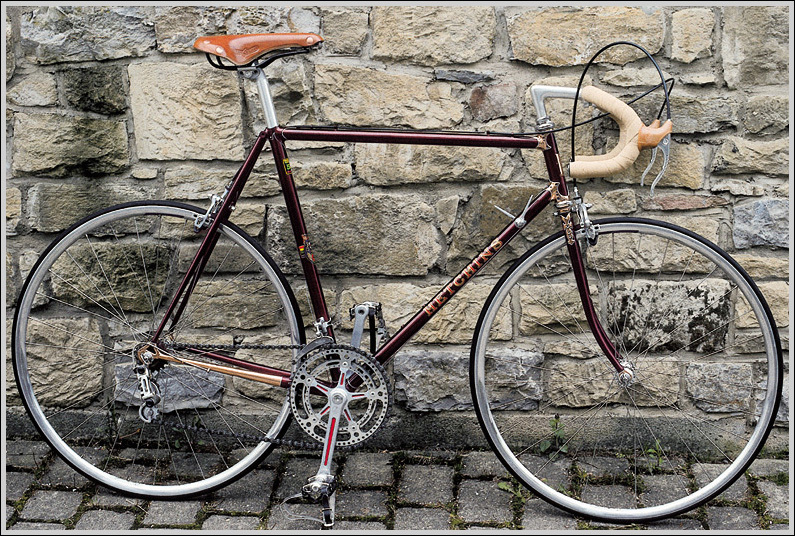 Historic Hetchins is dedicated to Hetchins bicycles of historic interest. The web site is concerned with the history of the marque, model types and frames of special interest, and assisting in the identification, dating, and renovation of Hetchins frames. 7. to provide a virtual museum of the Hetchins firm, its production and racing history, its bicycles & frames (Gallery), accessories, and related items. 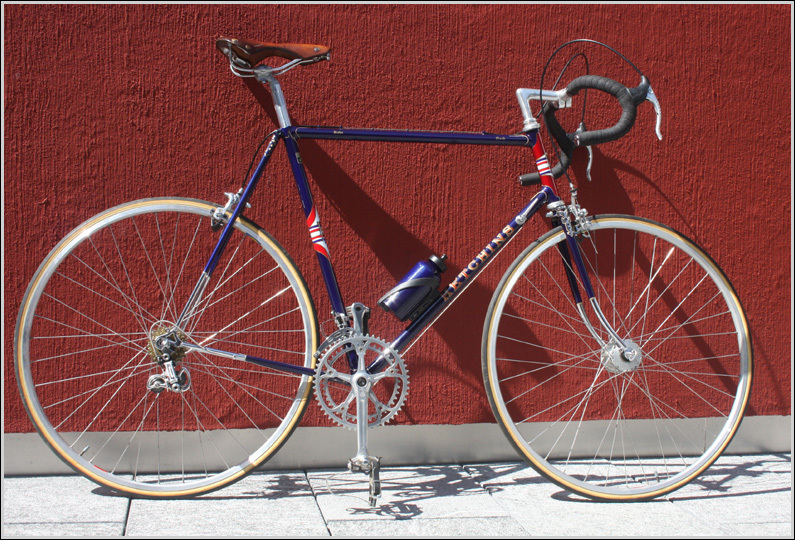 Above: 1976 Keyhole criterium racing bike. The bicycles and other related items displayed here are all in private hands, distributed all over the world. The Gallery section includes over 100 complete bikes covering more than 75 years of continuous production. A single collection of Hetchins bicycles and accessories of this magitude would be impossible to assemble, much less maintain, under one roof. Moreover, many of the bicycles featured here are still in daily use. Hence, a virtual museum is the most appropriate means of presenting these items to the public. Above: 1973 Italia touring model. The following abbreviations are used at this web site. VM: VadeMecum, XC: Experto Crede. st: seat tube, tt: top tube. The Editor has no first-hand knowledge of the Hetchins operation as it was under Harry's or Alf's direction; he depends for information on many other people and hereby expresses his gratitude. Every effort is made to ensure that the information provided is accurate (completeness is virtually impossible in this field). Further information, suggestions, and corrections are gratefully accepted. A number of people have contributed to this web site and their help is hereby acknowledged. The text, photos, suggestions, and encouragement they provide enrich this site. My sources, in alphabetical order, include the following: Dale Brown (CR Forum), Mick Butler (Paris Cycles), Marion Curwood (Jack Denny's daughter), Paul Hetchin (Hyman's grandson, Alf's son), Len & Jean Ingram (The Hetchins Register), Ken Janes (former Hetchins employee & lug cutter), Trevor Jarvis (TJ Cycles), Bob Johnson, Roger Lee (Hetchin's former USA distributor, www.WorldClassCycles.com), David Miller (current Hetchins manager), Andrew Moore, Doug Poll (Flying Gate Webmaster), Tom Rawson, Clive Rodell, Hilary Stone, Donald Thomas (Bob Jackson Cycles), others who wish to remain anonymous, and all those whose beautiful bikes appear here. Thank you all! --the Editor. Above: 2005 Earls Court Two. The fine print: This not-for-profit web site is privately maintained by and for Hetchins owners and enthusiasts. Costs of maintaining this web site are met entirely privately, with no contribution from the manufacturer or any advertiser. This web site is beholden to no commercial interest. Access to this web site is free of charge. This does not mean that the contents are up for grabs! All materials are copyright this web site or the manufacturer, unless otherwise noted. Unauthorized copying, hacking, alteration of content, and denial-of-service attacks are prohibited and prosecutable offenses. The Editor is not responsible for the content of other web sites to which this web site links or which may be linked to this web site. Above: 1984 Magnum Bonum Spyder. The site comprises over 450 html and pdf pages, over 3,000 jpg and gif fotos, and takes up over 600 MB of server memory. There is too much to see in one visit, so view a small portion and come back. The site has been here since 2001 and it's not going away. The Editor is not responsible for damage which may be caused to your retina by staring at pictures too long. 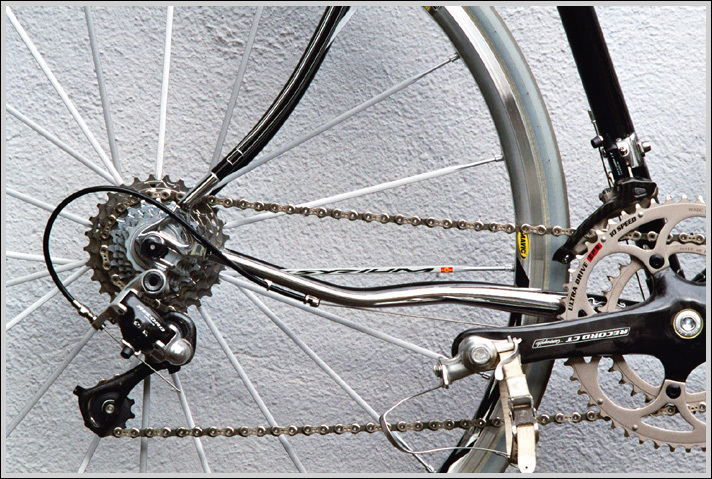 Use the web responsibly: spend more time on your bike! Click here for the rest of the legal stuff. 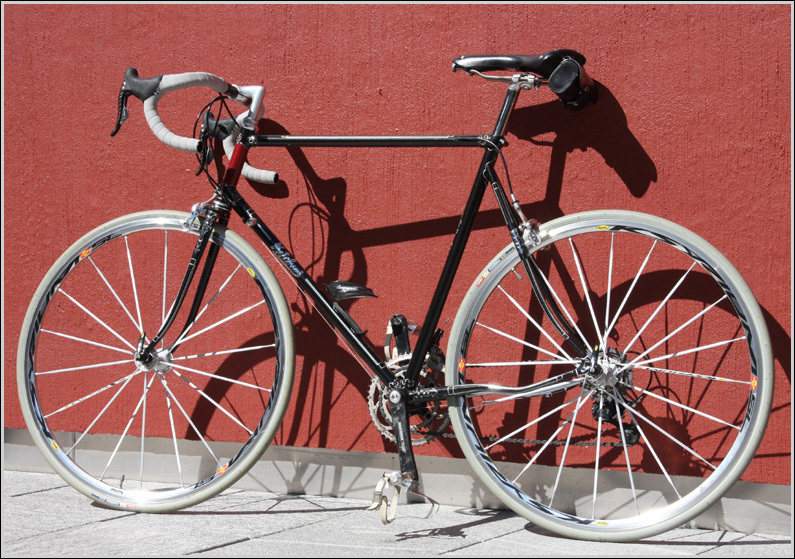 For those wishing to submit photos to be published at this web site, please see the Editor's tips on how to photograph a bicycle: click here. 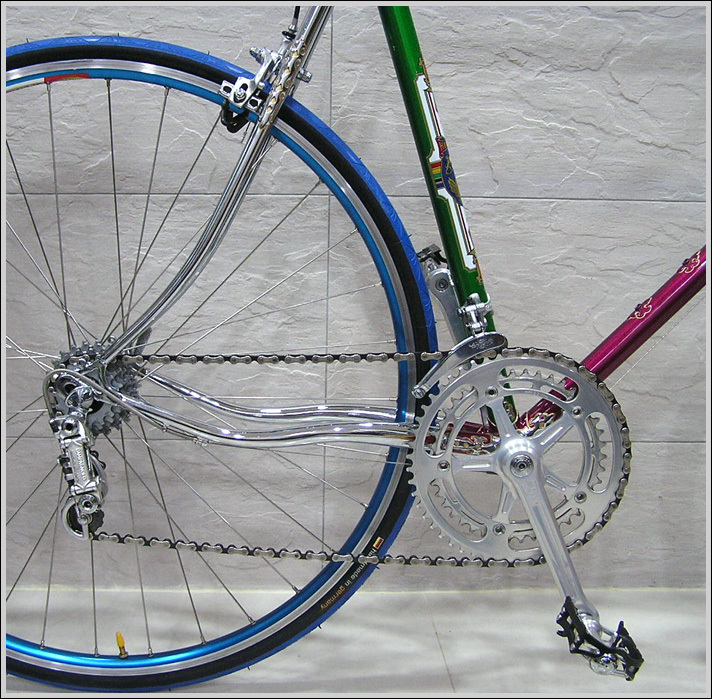 Above: 2005 special order frame using a lug design from 1948; modern Record carbon components. 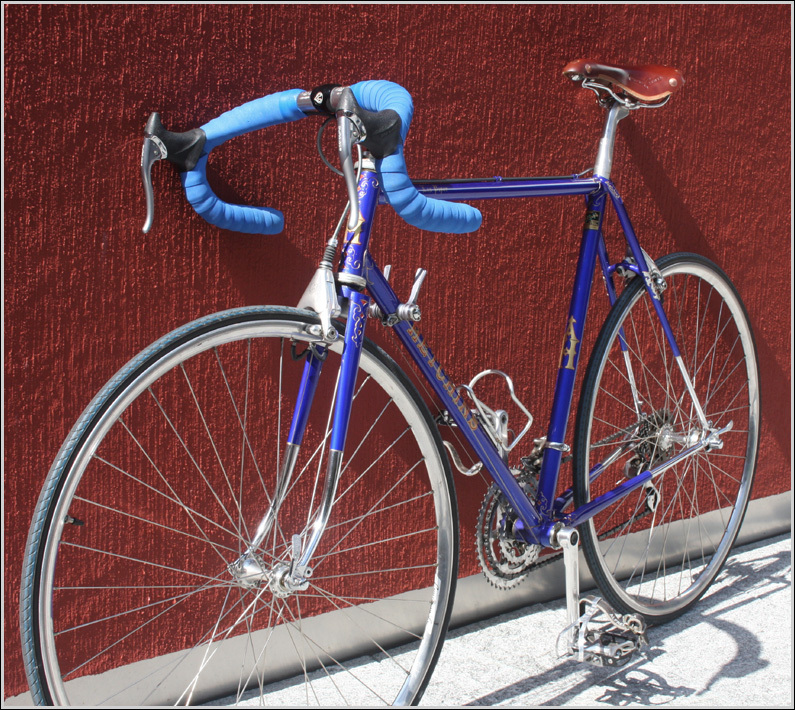 Below: 2008 Magnum Opus to fit vintage Campagnolo Nuovo Record components. Below is the navigation field. It contains links to the main topics. Links in italic lead to sub-navigation pages. To see a complete list of pages, click the toc (table of contents) link. The gold "H" symbol at the bottom links to the home page.